Awarded $500 by the arbitration board for injuries received in the fire. Mrs. Tarascio was pushed off her chair and struck in the back by falling debris, her hair was singed and she received brusies and abrasions to her limbs and ankles. She experienced severe nervous shock, and continued to suffer from nervousness and stomach pains that required medical attention. Awarded $3,500 by the arbitration board for injuries received in the fire, including a sprained back and multiple contusions over her body. Awarded $3,882.20 by the arbitration board for injuries received in the fire, including second degree burns of both arms, upper back, shoulders, and top of head. Mrs. Temkin sustained a twisted right foot and ankle when her foot became stuck in a step while escaping from the burning big top. Awarded $2,840.50 by the arbitration board for injuries received in the fire, including second and deep second degree burns of both arms and right thigh, experienced nervousness and was unable to sleep. Awarded $800 by the arbitration board for injuries received in the fire, consisting of a bruised right leg, coughing and digestive trouble since the fire. Attended circus with her mother and 3 children. Mrs. Thomas saw two dirty looking men who appeared to be circus help sitting to the right of the main entrance, about halfway down. She heard one man say to the other "let's sit in the back row" and soon after she saw the fire on the canvas roof. She did not see fire on the sidewall. Angelina and her family exited the tent and saw nothing more of the suspicious men. Was in the Municipal Hospital suffering from severe burns. She attended the circus with her husband and son, Joe Thompson and daughter Judith Doyle. The latter was slightly burned and was able to return home after treatment. Attended circus with his wife, Mrs. Anna Doyle Thompson, and son Joe Thompson and his wife's daughter Judith Doyle. Attended circus with his father, his mother Mrs. Anna Doyle Thompson, and sister Judith Doyle. Listed as "Robert" in some reports, "Joe" is confirmed to be correct by the family. Attended the circus with his father Dr. Lawrence Thompson and family friend Dr. Paul Mason de la Vergne and his wife and son Elizabeth and David de la Vergne. The group sat in the top row of bleachers, but Elizabeth relocated to a lower seat due to her fear of heights. The men escaped the tent by sliding down the ropes behind the bleachers and dropping the boys down; Elizabeth never made it out alive. Attended the circus with his son Jack Thompson and family friend Dr. Paul Mason de la Vergne and his wife and son Elizabeth and David de la Vergne. The group sat in the top row of bleachers, but Elizabeth relocated to a lower seat due to her fear of heights. The men escaped the tent by sliding down the ropes behind the bleachers and dropping the boys down; Elizabeth never made it out alive. Attended the circus with the Jim McCarthy group, all escaped unharmed. Read Jim McCarthy’s story here: Personal Accounts - Page 8. Attended circus with her grand-daughter, Sandra Louise Logan, and her daughter, Lillian (Tillbrook) Logan. Sandra perished in the fire. Attended the circus with her brother John Titus and Edna Ferrante. They sat in the southeast bleachers, and were one of the first to escape, exiting between the southeast bleachers and Section K. Nobody in the group was injured. Attended the circus with his sister Irene Titus and Edna Ferrante. They sat in the southeast bleachers, and were one of the first to escape, exiting between the southeast bleachers and Section K. Nobody in the group was injured. Was awarded $1,200 by the arbitration board for injuries received in the fire. Mrs. Toccalini was pregnant when she attended the circus, and was violently pushed and thrown to the ground, was struck by collapsible chairs, and had to jump over the steel railing to the ground. She suffered injuries to the right leg and back, and also miscarried. Attended the circus with his aunt Helen Kaminski and cousin Al Kaminski (youth). Albert attended the circus with his mother, Louise Toth, his sister Louise, and his sisters Joan and Regina Toth who were celebrating their birthdays. His sister Louise was the only one to escape unharmed; Joan and Regina perished in the fire, and Albert and Louise survived with severe burns. Albert was given a 10% chance of survival, and beat the odds. He passed away in 1987. Mrs. Toth attended the circus with her son, Albert, and her daughters Louise, Joan and Regina. Her daughter Louise escaped without injuries, but Joan and Regina perished in the fire; Albert and his mother Louise survived, with severe injuries. Mrs. Toth was hospitalized in a coma for a couple of months with severe burns. She passed away in 1988. 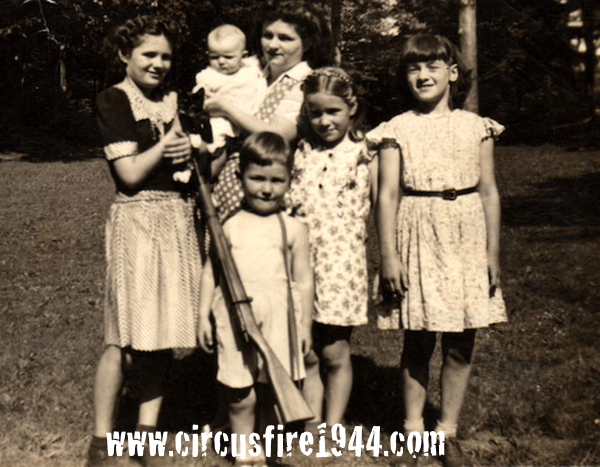 Louise attended the circus with her mother, Louise Toth, her brother Albert, and her sisters Joan and Regina Toth who were celebrating their birthdays. Louise was the only one to escape unharmed; Joan and Regina perished in the fire, and Albert and Louise survived with severe burns. Read an excerpt from Louise's memoirs HERE. Attended the circus with a group of friends, while his mother and sisters were seated in another section. Aubrey jumped from the top of the bleachers and used his pocketknife to cut an opening in the canvas wall of the big top so that he and others could escape. Was awarded $4,000 by the arbitration board for injuries received in the fire, including a fracture of her left leg at the ankle, injuries to both hands, and bruises sustained when she jumped from the top of the bleachers. 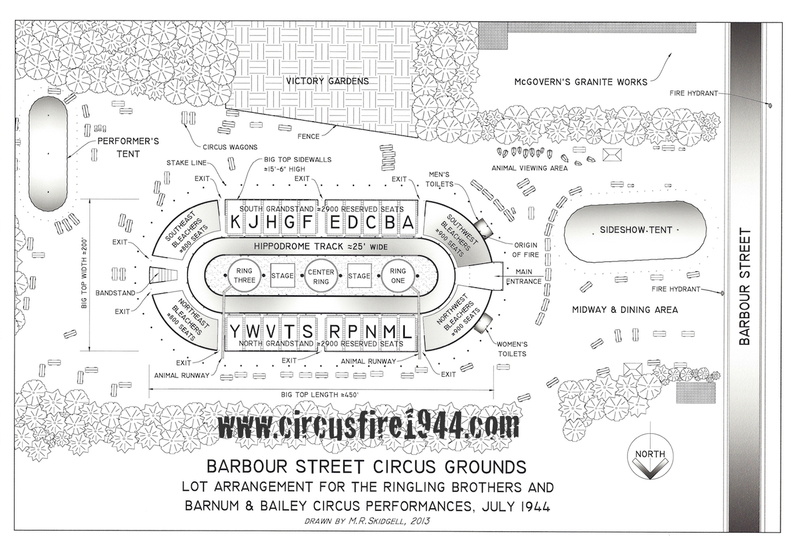 Attended the circus with his cousin Robert Everett Johnston and uncle Robert Frederick Johnston. All of them survived the fire. Was awarded $900 by the arbitration board for injuries received in the fire, including first degree burns on his face and skull, and second degree burns on his forearm. Was awarded $750 by the arbitration board for injuries received in the fire, including first degree burns on her face, extensive burns to her left forearm, and injuries to her back.